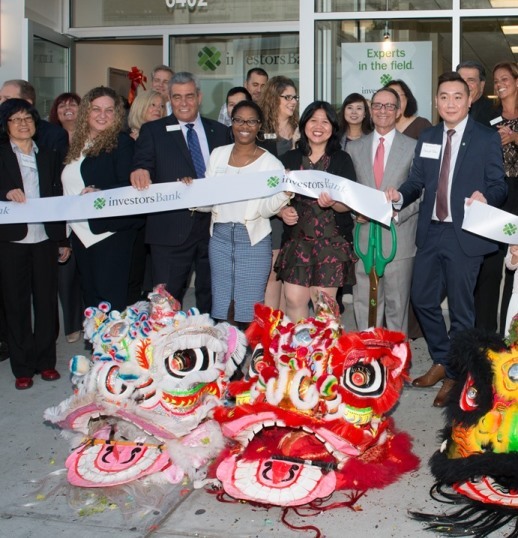 Brooklyn, New York – Investors Bank is inviting everyone in the neighborhood to the Grand Opening of its 18th Avenue Branch in the Bensonhurst neighborhood. To introduce Investors Bank to the community, the 18th Avenue Branch team recently hosted special ribbon cutting ceremonies. The nonprofit United Chinese Association of Brooklyn (UCA) brought its talented Lion Dance performers to the branch for the event. Clad in elaborately decorated white, red and yellow lion costumes, UCA’s youth group paraded in front of and through the branch to bring good fortune to the business, its employees and its customers. As part of Grand Opening Celebration, the 18th Avenue Branch is holding weekly drawings for magnificent prizes such as a Kindle Fire®, a 32GB Apple iPad®, and a Fitbit® Alta. People 18 years or older may register at the branch each week during the Grand Opening Period from June 1through August 25, 2017 to win one of twelve prizes. Please visit the branch for contest rules and regulations. Through its new branch, Investors Bank is providing special promotional rates on consumer money market accounts as well as certificates of deposit (CDs) for businesses and individuals. The CDs can also be used for individual retirement accounts (IRAs). Each time a consumer or business opens a new deposit account with a special interest rate between June 16 and July 13, 2017, Investors Bank will donate $25 to one of the three local nonprofits. Customers can choose one of three local nonprofit organizations: Bonei Olam, St. Athanasius Parish or the United Chinese Association of Brooklyn. Mr. Tam invites neighbors to visit the branch or to contact him by phone at 718-331-3120. The hours for the 18th Avenue Branch are Monday, Tuesday, Wednesday and Friday from 9:00 AM to 6:00 PM. On Thursdays, the location is open from 9:00 AM to 7:00 PM and on Saturdays from 9:00 AM to 2:00 PM.